I am Kathryn’s daughter. It’s with a very heavy and aching heart that I have to inform you that my mother was taken from us suddenly and unexpectedly in the early morning hours of December 21st as the result of a serious stroke. As I’m sure you all know, my mom was a generous, kind, sweet, intelligent, and all-around amazing person and she will be greatly missed by anyone who knew her. I want you all to know that being a member of this community and acting as an advocate for people was so very important to her. She cherished all of the relationships and friendships she developed within this community and she was always talking with me about people she had met through her blog. I know that it is difficult to celebrate and mourn people that you may have never met in the physical world, but please take comfort in the fact that my mom gained much strength and joy from her interactions with all of you. Unfortunately, we are not familiar with all of the people she met through this blog and her other online groups, so if you would like to hear from us, please leave your contact information in a comment. Thank you all for all of the joy you brought my mom. I was so saddened to hear of Kathryn’s brain hemorrhage and passing. It was a blessing to know your mother as a friend through multiple FaceBook groups and blogs as well as reading her book. Though we only communicated online and we never met in person, I felt I knew Kathryn’s grace, compassion, faith and fortitude. My life was enriched in knowing her and she impacted me personally in many ways. It is because of information she shared, I have learned of several therapies that are helping me currently manage my own MCS. I am lifting you and all of Kathryn’s family up as you go through the holidays grieving this huge and very sudden loss. I wrote a tribute and reblogged others here on Monday. Thank you for bravely and considerately posting this notification about your mother’s sudden death. All of us who knew your mother through Dr. Rea’s clinic were terribly saddened by the news of your mother’s passing. Your mother’s ability to reach out to people brought her friendships from many different worlds. Whether it was the world of multiple chemical sensitivity (MCS) or books, your mother forged strong bonds with those whose lives she touched. I was fortunate to know her from Dr. Rea’s clinic and to have benefitted from living in the same apartment complex, Regina Coeli, run by the Remmels. She was so kind and compassionate to me even while she was dealing with health issues more daunting than mine. We would sit at the kitchen table in Apartment 104 and look through catalogs from which your mother would then place orders for us so we could replace the clothes we had lost through exposure. I could neither use a phone nor touch a computer because of EMF sensitivity, and I was so grateful for her help. Your mother also invited me to join Rave Reviews Book Club, and membership has brought many benefits. Do you know that founder Nonnie Jules has set up a memorial page to your mother? I will send the links in another comment when I am at my computer. My sincere condolences to you, your sister, your father, aunt, and grandmother. As shocked and as saddened as I am, I can only imagine how all of you are feeling. You are all in my thoughts and prayers. Your mother touched many lives and helped many people and she continues to help people through her book. My heart is aching for you and your family. I hope you can feel comfort in knowing your mother is with her father and others who have passed on before her and she is free of her mask and her physical limitations. What a joyful day when you are with her again. Your mom was an inspiration and support to so many. Please know that you are not alone in your loss. We share it with you. Your mom was a regular participant in my Facebook group and Twitter chat. She always made a point of greeting new members. I will miss her friendship and support. We never met in person, but we spoke several times on the phone. 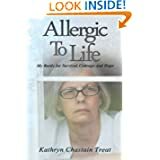 I’ve credited her several times in my blog for her great ideas for handling chemical sensitivity. I’m planning to blog about her, so please let me know if there are any memorial funds or online tributes we should know about. I am so sorry to hear of your mother’s passing. She was extremely supportive of me and my chronic illnesses and was so kind when my husband pass away recently. She will be missed greatly. One of my online friends passed away on Dec. 21st. It must be so hard for you to have written this. Thank you for doing so. We all care so much, for her and for all of you. She touched many lives and will continue to do so. There has been a wonderful sharing on Planet Thrive about Kathy and I thought I would copy and paste it for your family and send it to you. I have your mailing address. I will do that soon after Christmas. My prayers and thoughts are with you and your family. I will miss her dearly. I’m so so sorry. We were mutual supporters of our writing and friends. Thank you for the post. I know how difficult it is to lose your mom. Thank you everyone for your thoughtful words. I wll share them with my sister and my dad. Thank you, Deb for setting up that beautiful memorial and helping me to share this very sad news with her many friends across the country. Jennie Sherwin, I look forward to receiving the link to the page that Nonnie Jules set up for her. We have yet to determine when services will be held, but we do plan to hold one after the holidays are over. I’ve heard something about a scholarship or fund in her name, but am not sure of the details. Whenever my mom heard about someone passing–be it a friend or someone she barely knew–she would always make a donation to a charity rather than send food or flowers, so I’m sure that’s something she would like for herself. I’m not sure what particular charity at this point, but will talk to my family. I am so very sorry for your loss. So sorry. My condolences and prayers go out to everyone who has been touched by Kathryn. I think her caring and kindness left a deep impression on everyone. She will be missed. I met Kathryn and became close to her at the very beginning of our twitter relationship and Rave Reviews Book Club. I was there when Nonnie Jules started RRBC and Kathryn was there. I got her book and talked to her about her issues. She was a brave woman and I admired her for fighting this thing.Now she can rest and not suffer anymore. I am very sorry for your loss and ours. My heartfelt condolences to you and your family, May you know of no more sorrows. Your mom brought me so much comfort as I struggle with my health and my own allergies to everything. My heart aches for you. Thank you for sharing your mother with us; my thoughts are with you and your family as you deal with her loss. If you would like to remain in contact, my email is michelle_willms at yahoo dot com. I am sorry to hear this. We were online blogger friends and I enjoyed reading her posts. My sincere condolences to your family. I dont know if your family is religious but Revelation 21:4 has brought me comfort when dealing with the loss of a dear loved one. First, I am so, so incredibly sorry for your loss. It is incredibly good of you to come here and post, especially during a time that is unimaginably painful for you. Second, I was completely devastated to hear of your mother’s passing. There was a time during my illness when I wasn’t sure I wanted to go on, but your mother was so kind and supportive, her words encouraged me to hang in there. She took the time to respond to all of my blog posts, and always had an encouraging, supportive word. Without her, I’m not sure how I would have made it. I won a copy of your mother’s book when it first came out, and I was reading the inscription yesterday. It brought tears to my eyes. Please know she did so much for so many, and she loved you, your father, and sister so dearly. I will keep checking here to keep updated about any arrangements. Thank you for this post, it’s much appreciated. Not a day passes by that I don’t think of her and miss her friendship and our online chats (as a fellow RRBC board member, we were in daily contact). If she is missed so much by us, her online friends, I can only imagine your pain and sense of loss. You are all in my thoughts and prayers. I am so sorry for your loss. I only knew your mom from blogging, but I will miss her presence. You are in my thoughts and prayers. Please know that I admired your Mum greatly, as both a person and a writer, and I count her as one of my dearest blogging friends. I apologise for not contacting you sooner but I literally did not know until about half an hour ago. Even now I find it hard to truly believe Kathryn is gone. Please post the details of any charity you think she would like us to donate to. I just don’t know what else to say. I’m going to miss her. I’m just reading this now and am so sorry for your loss. Know that your mother’s words have been a source of support and inspiration for many. Wishing you peace. I am writing to tell you that I will miss your wonderful, caring, loving, intelligent, supportive mom. Oh, I will miss her forever. Each morning, when I open PnPAuthors and see her picture among my members my heart skips a beat because she was my greatest pleasure to communicate with. I had the honor to meet her, my husband and I, Peter, meet your father and mother at a local café in Merced and we dined outside and discussed our books. At a later date she participated in one of PnPAuthors books which we published. She had a couple poems in that book. I am not sure she bought the published book, but if you’d like it, I will indeed buy it and send it to you. Pease tell your father, we are so sorry, and if he ever needs us to please contact Peter. I think, as it turned out Peter and your father knew one another before we met that day. Peter is from Merced too. In any case, honey, I am so sorry for your loss, your father’s loss, and all of us who know Kathryn was a very special lady. There is not a day that goes by that I don’t miss Kathryn. She was such a thoughtful wonderful lady.